A wedding is a very joyous and blessed event in your Sacramental life. We congratulate and pray that as you begin your new life journey together, you will continue on your faith-journey together as well . We realize the planning process for a wedding often includes many decisions including liturgical decisions for the Mass or Ceremony. We created two brochures that provide you with our parish policies and guidelines as you begin making your arrangements with our parish. The two brochures will provide information on music selection, art & environment, flowers, Mass/Ceremony times, required documentation, photography, and fees. You may find links to these brochures in the left margin of this page under the "Wedding Resources" heading. Please read through our policies and guidelines thoroughly. NOTE: You must be a registered and active parishioner at St. Ann for at least one year before we will consider wedding date requests. 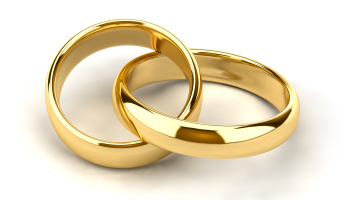 The Sacrament of Marriage is an important step in your faith life. To live your Catholic faith, you must be true to your commitment and obligation to regularly attend Sunday and Holy Day Masses. To begin the process, please contact the Parish Office (708-895-6700) at least SIX MONTHS prior to your desired date. It is strongly advised to make your Church arrangements before ANY other arrangements.